Picnics, barbecues, and potlucks are all looking for a jazzy side dish. Well I have you covered! My Grandpa once asked me how I come up with all my recipes, specifically, recipes that I have done for magazines. Many times it starts with a theme. Using this recipe as an example I was grilling chicken satay for dinner and wanted to serve something with it that had good Asian flavors. I love Vietnamese spring rolls but didn’t have the rice paper wrappers on hand which meant I needed to improvise. This is where a recipe idea is born. Once I get something in my head it is hard for me to shake it until I get in the kitchen and make it. I love a good rice bowl and figured I would use that concept and just create a salad full of the Vietnamese spring roll flavors with out the actual wrapper. BINGO! This bowl is filled with herbs that are easy to grow in your garden. AND you don’t need to turn on the stove to prepare it making it the ultimate summer dish. 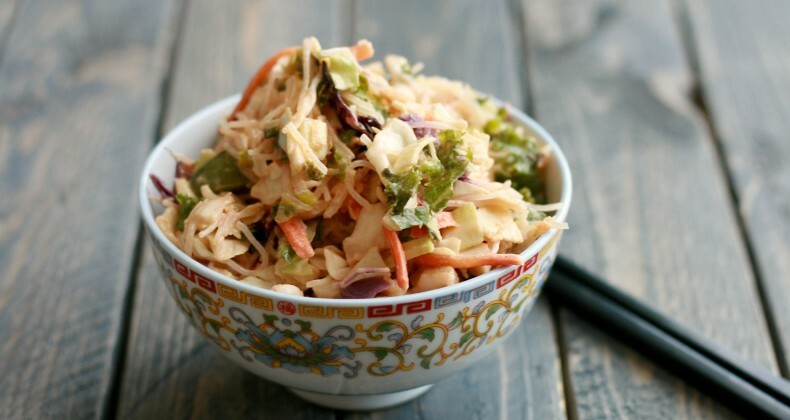 Eat it for lunch on its own or pair it with grilled meat or fried tofu for a tasty side dish. The spring rolls are usually served with a peanut sauce. Using that as inspiration I thinned it out slightly and turned it into a dressing. CHA-CHA-CAH! Cling on to the remaining days of summer and jazz up your next barbecue with a fun new side dish. NOT ALL HOISEN IS GLUTEN FREE! Joyce Chen makes a delicious gluten free hoisen sauce. Make sure to read your labels! 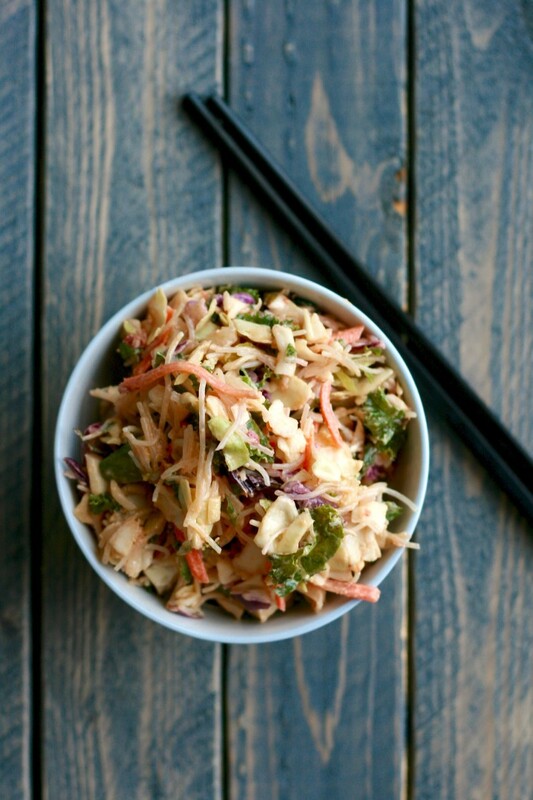 I used Dole's Chopped Asian Blend salad mix (green and red cabbage, kale, broccoli slaw, snap peas, and carrots) You could make your own blend or use a cole slaw mix too. Yum! This looks like a super easy recipe. Will have to try this. I bet my husband would love it! It is full of great flavors with out being complicated. Do you have any formal food development training? This recipe sounds delish–and you seem to know a lot about flavors and food. Love learning from you! No formal training in the way of classes or the like. I have been at it experimenting in the kitchen for nearly 15 years. Lots of trial and error in my case! So basically I need to live at your blog. Is that okay?? This looks SOOO good!! !